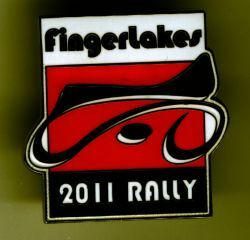 Here are images of the pins for the last several rallies. These are the four pins we used during the span from 1997 to 2000. Isn't it a great idea? As far as we can tell, there are about 350 rally guests who have all four. 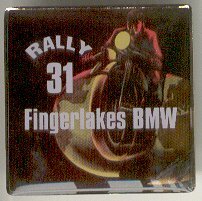 Most of these folks stood right at the Pin Table and filled out their floating Roundel immediately. Credit Shari for the concept. In 2001, we returned to something more conventional, choosing an outline of our state. 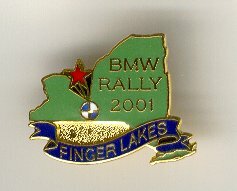 The Roundel is centered on Watkins Glen and shows a "rising star" emanating from it. Note that, unlike most small physical representations of New York State, this one does include Long Island. 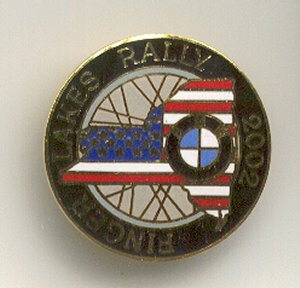 For 2002, since the rally was just two weeks prior to the 1st Anniversary of the attacks on the World Trade Center and the Pentagon, our rally chairpersons asked our pin people to design one for us. The guidelines were "do something patriotic." Robin submitted this layout and we accepted. 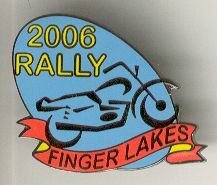 For 2006, we returned to the popular Cloisonné style pin. This design was one of several submitted by club members at our annual banquet, and chosen by a vote of the members present. 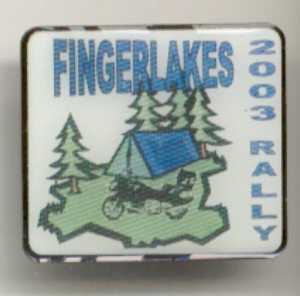 2007 is another Cloisonné style pin. Again, this design was one of several, and chosen by a vote of the members. 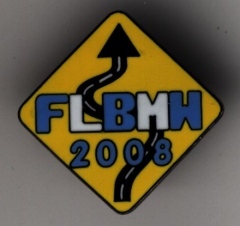 The design for the 2008 pin reflects what we like to do best: find a curvy road! It is a Cloisonné style pin as well. Finger Lakers thought that the 35th year was significant, so that number receives prominence in the center of the design for 2009. 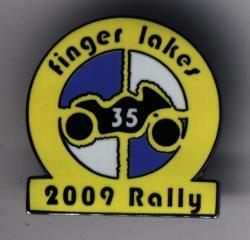 The pin for the 36th rally, in 2010. ...and number 37, in 2011. Rally number 38, in 2012. 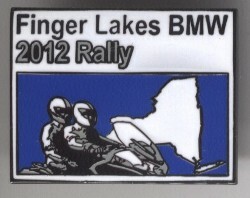 All of these pins were ordered from Lannoye Emblems, Inc. , and we can recommend that any club use their services. They are very pleasant people and can handle your business electronically. 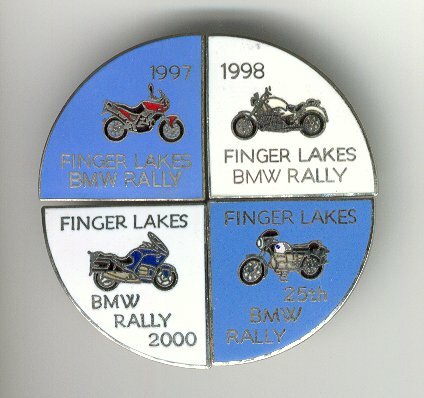 The four parts of the Roundel for 1997-2000 were each ordered separately in the respective year, and Robin got it right each time. Thanks, Robin. Recently, Robin has moved on, and it's Vicki and Lorrie who are the experts in charge at Lannoye Emblem. (Whoops!) In 2010, Vicki retired and Richard joined the team as the graphics expert. So, thanks, Lorrie and Richard!